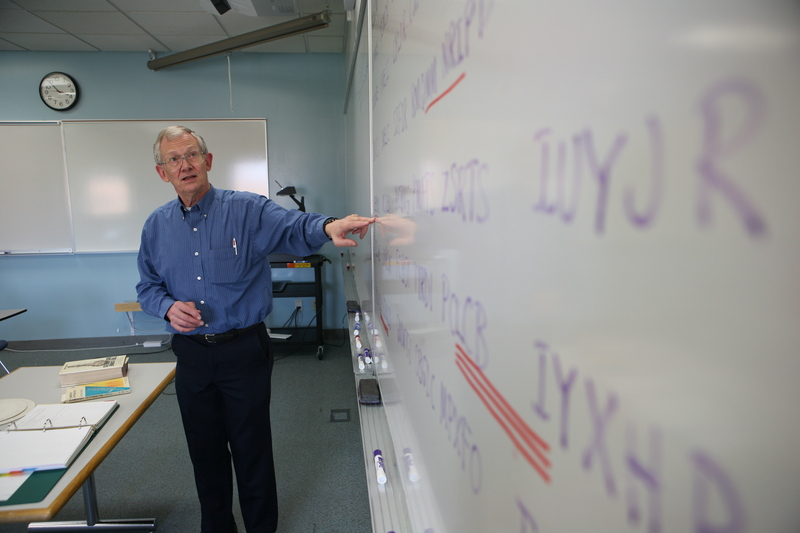 Professor John Holte explains the process of decrypting text written with replaced symbols. Emily Thielman ’05 loves solving puzzles. When selecting a January Interim Experience in 2004, she chose a cryptography course, in which she studied how one can decrypt secret messages without knowing the enciphering key, through using a combination of mathematics, statistics, computer programming, and a lot of trial and error. While the puzzles were often a great deal of work, Thielman found the challenge kept her busy during the chilly month of January. “I actually remember having fun doing my homework,” Thielman said. At the time, she had no way of knowing how she, along with John Holte, professor of Mathematics and Computer Science, would later help another Gustie solve a family mystery dating back nearly 100 years using cryptography. After January Interim Experience was over, Thielman started spring semester at Gustavus Adolphus College with a new roommate, Rachel (Kvanli) Dickinsen ’05, who had just returned from Greece. They quickly became friends. 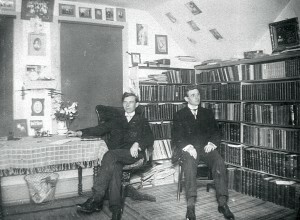 Some time later, Thielman traveled to the Kvanli’s family home. While she was there, Thielman learned that the family was working to scrapbook and archive old family memorabilia. Looking at some of the memorabilia, they discovered some old postcards written in symbols. Rev. 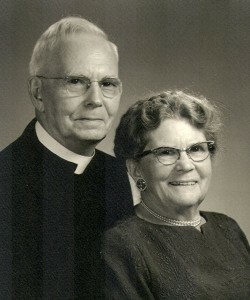 Swan Swanson and Marie Johnson met in elementary school, stayed connected by writing encrypted postcards, and were later married. The Kvanli’s family knew a great deal about the postcards and why they were sent. The Rev. Swan Hjalmar Swanson 1910 was born in Sweden and moved to Mahtowa, Minn. where he met his one and only girlfriend, Marie E. Johnson, in elementary school. After Swanson was confirmed, he attended the Academy, a program for high school students at Gustavus before beginning undergraduate pre-ministry studies at Gustavus. Being far from home at Gustavus, Swanson relied on the mail to keep in touch with his girlfriend. At the time, postcards were just one cent to send, providing an inexpensive method of communication. According to his granddaughter, the Rev. Heidi Kvanli, he was really interested in languages, and wanted to develop a system so that he could send postcards in a way that messages could not be read by members of the family or by postal workers. Nearly 100 years later, though the family knew the story behind these postcards, they had no way of understanding what they said. Thielman remembered what she learned in her January Interim Experience course, and wondered if her professor, John Holte, could decipher what was written on them. 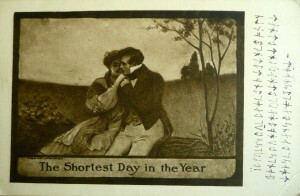 An original postcard sent from Rev. Swan Swanson to his future wife in Northern Minnesota. When Thielman met with Professor Holte, he was quickly intrigued by the pieces of family history. “I liked the challenge, and it was fresh in my mind. It was the kind of problem we were presenting all [month] in this course,” Holte said. While he was interested in the challenge, trying to determine what the postcards said required a bit of knowledge and research of ancient symbols. “I looked at them and thought they looked rather like old ancient Viking runes. So, I went to the library and started looking things up. They’re called Futhark,” Holte said. Once Holte figured out what the symbols were, he had to figure out they were used to encode the message on the postcard. He worried that the message was written in a language he was not familiar with, like Swedish, or worse, Old Norse. After working with the text, Holte determined that the postcard author had encrypted a message in English using Futhark symbols to represent letters from the English language, an encryption technique called monoalphabetic substitution. “I did some statistical analysis and pattern matching, some of the techniques that we learned. I determined that it seemed to be a monoalphabetic substitution. I did tallies of the various symbols, to see what the relative frequencies were. In different languages you have different relative frequencies, like in English ‘e’ is the most common, followed by ‘t,’” Holte said. Professor Holte was able to develop a key to decipher postcards such as this sent from Rev. Swan Swanson to his future wife in Northern Minnesota. 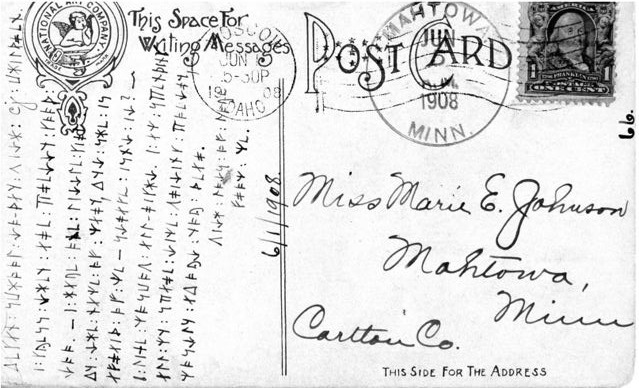 After a great deal of trial and error, Holte was able to produce a table that listed the English characters corresponding to the symbols that were used on the postcards. He had solved a mystery dating back to 1908. “These postcards were like journal entries from an age gone by,” Holte said. Holte believes that this kind of communication was more common in the early 1900s than it is today. “They didn’t have telephones everywhere, so communication was much slower. I have two or three postcards from my grandfather back in the days of the penny postcards that he had written to his fiancé,” Holte said. While cryptanalysis may sound like an arcane subject, it has been very important in numerous wars, which was one of things that sparked Holte’s interest in the subject, and something that was very much a part of the course. After reading a text by Abraham Sinkov, who served on a team that broke codes for the United States Military during World War II, in college he was hooked. “Their most famous success was breaking the Japanese Purple Code, [Japan’s] highest level of diplomatic code before Pearl Harbor. They actually had a message that had been sent to the Japanese embassy that didn’t say explicitly that the attack was coming, was the reason the message was sent, and one could have read that. The code breakers had read this before the Japanese embassy had translated it themselves. They couldn’t get the alert out to the rest of the military before the attack occurred,” Holte said. Rev. Swan Swanson with a fellow Gustavus student. Holte integrated history into his cryptography course, providing students with a background and connections in a different area of study that is very relevant to the topic. Today, cryptography is used to scramble computer messages as they travel across the Internet, giving the topic a new level of relevance. Cryptography also continues be of vital importance in protecting our country. The National Security Agency, the United States agency charged with breaking codes of other countries and protecting our own, utilizes acres of computers and employs the largest body of mathematicians in the country. The Kvanli family was delighted to learn what the postcards said. 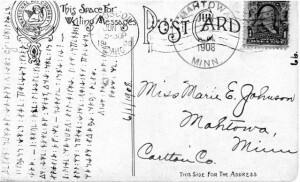 The family also had additional postcards that could be decoded using the same key, providing a greater window into the life of a family member and early Gustie. Beyond serving as a family treasure, the pieces serve as a beautiful collection of writing from an earlier era. Swan Swanson was very artful with language, having written a class poem; a class song, which was sung at the 1910 graduation ceremony; and many other pieces about Gustavus. The challenge these postcards presented brought several generations of Gusties together, as they celebrate the college’s past in a unique way.